Knowledge : Mon-tsuki - KIDORAKU Japan - What a Kimonoful World! 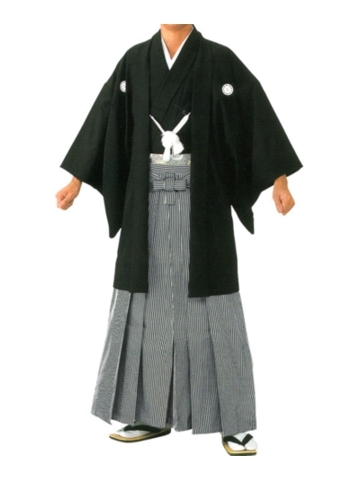 Mon-tsuki is a formal kimono with family crests. Also it's worn for funeral. "Mon" means "family crest", and "Tsuki" means "putting on". The fabric is plain / solid, and it has family crest. Having 5 crest is formal, but 3 or 1 crest are allowed. and it is the most formal kimono of men. Hakama (a long pleated skirt/pants worn over kimono). It has 5 family crest, and its material is the highest class silk called "Habutae". it means "Kuro Mon-tsuki + Haori + Hakama". It's equivalent to tailcoat, morning coat or frock coat of Western clothes. Color Mon-tsuki is called "Iro Mon-tsuki". It's also men's formal kimono. has 5 or 3 or 1 family crest, and is made from "Habutae". If it has some family crest, Omeshi & Tsumugi & Edo-Komon can be worn as semi-formal. It's also a kind of Mon-tsuki, and is called like "Mon-tsuki no Omeshi"
to distinguish it from Kuro Mon-tsuki.